With Style and a Little Grace: It's a CHRISTMAS GIVEAWAY! Hi Friends, I am so excited to announce that I am doing a fun Christmas Giveaway to thank y'all for reading and because I am really feeling the Christmas spirit. It will run today through Friday the 12th. I will announce the winner December 15th and mail to you so you get it before Christmas. There are only three rules! 3. Leave me a comment and tell me what you would do with this fabulous perfume set! What are you going to get? 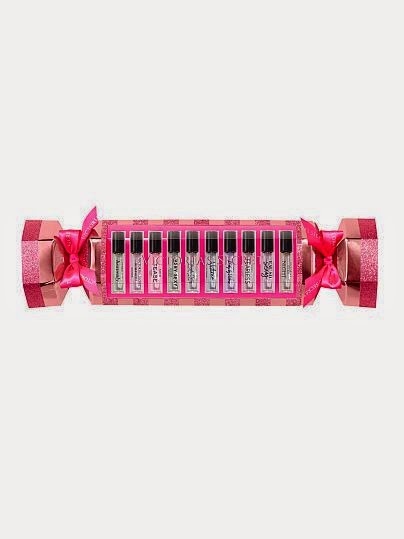 This fabulous cracker from Victoria's Secret filled with 10 of their top fragrances. Who wouldn't love that for the Holidays and I just love the festive packaging! Tis the Season y'all! Good Luck!!! Followed on all 3 :) The Google+ link was giving me a little trouble, but I think it went through! Let me know if it didn't. If I won, I would probably choose a few scents for myself, then include the rest of them in gifts for my friends! 'Tis the season for giving!